Want To Try A Different Vegetable? Answer: A subtropical vine that has beautiful white fringed, lacy flowers that have a sweet perfume, leaves that when crushed smell like “hot buttered popcorn,” and edible fruit that can grow up to three feet or more long and looks like a creature. Question: What is Snake Gourd? Snake Gourd (genus Trichosanthes, which is Greek for “hair flower”) is an edible gourd grown throughout India, Australia and Insular and Mainland Southeast Asia. Because it loves hot, humid climates, it is a good plant to grow in our hot, humid Dallas summers. Though most snake gourds can grow to enormous lengths, there is a shorter variety, called Snake Gourd India Short which grows only to about four to six inches. All true edible snake gourds, Trichosanthes anguina or T. cucumerina, get soft when ripe and usually disintegrate on the vine, unlike many mature gourds that form a hard shell. They are eaten when very immature, while the fruit is tender and the seeds are still soft. The mature fruit turns bright orange when ripe and has seeds surrounded by a bright red pulp. The mature fruit often breaks open spilling the contents, which look like big clots of blood (hence the name “anguina”). The red pulp is sweet to the taste and considered a delicacy by Southeast Asian children. 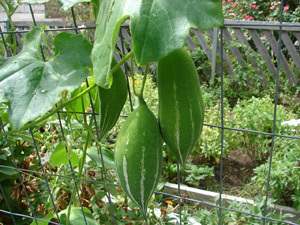 Snake gourd seeds can be planted in full sun in late spring after the soil is warm. The seeds have a hard coat and need to be soaked overnight. Though the vines can sprawl on the ground, they do best when grown on a sturdy trellis. Trellised snake gourds, especially those with stones tied to the blossom end, tend to be straighter than the curved gourds that are left to grow on the ground. The fruit of the India Short variety is picked just before it turns from moist to dry feeling. The longer varieties are harvested when they are about 16-18 inches. With a taste reminiscent to cucumbers and texture similar to zuchinni squash, Snake Gourd can be fried, stuffed or boiled. It is also good in soups and stir-fry. Snake Gourd is often used in Indian dishes and there are many recipes using it on the internet. Finding edible snake gourd seeds is somewhat difficult. I recently tried to order on Ebay seeds of Snake Gourd India Short from a grower in India. However the seeds were confiscated at US Customs. There are however several seed companies that sell the edible long variety, so check on the internet. However, just be sure that you are ordering edible Snake Gourds, either Trichosanthes anguina or T. cucumerina. There is another ornamental, hard shelled variety that is used in crafts that is readily found in seed racks even in our big box stores. Though they would be fun to grow, they are not edible. Posted in Vegetable Gardening in Dallas and tagged snake gourd, vegetable gardening, WaterWise gardening. Bookmark the permalink.